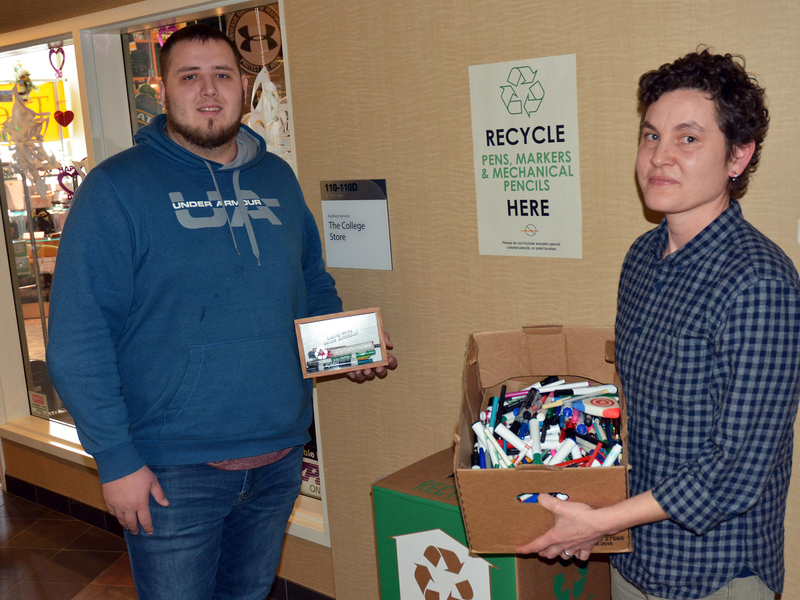 SUNY Oswego students and faculty have started collecting exhausted writing utensils -- markers, pens and even mechanical pencils -- and sending them to a recycling company in the latest of many efforts the campus community has taken to go green. Six students in a technology class of Daniel Tryon launched the effort, manufacturing 212 wooden collection boxes last semester from old Swetman Gymnasium bleachers. “Each box has a laser-engraved finish to add design details on the top, inside and front panels," said Erika Wallace, a senior in technology education who helped manufacture the boxes. The boxes are "designed to be easy to use, light weight and magnetic to fit right into the school environment." Sustainability advocate Kate Spector, mathematics specialist with the Office of Learning Services, plans to work with students to continue distributing the boxes. They will mount the boxes on magnetic whiteboards in classrooms and other likely spaces around campus -- the Tutoring Center, Penfield Library and others -- where empty dry erase markers and other writing implements routinely have been tossed in the trash. The wooden boxes, fronted with a slotted acrylic panel, hold 15 to 20 dry erase markers each, more for smaller implements. After routine collection, students will empty the utensils into a well-labeled green cardboard recycling box -- TerraCycle refers to it as a "zero waste box" -- just outside the College Store on the mezzanine level of Marano Campus Center. The larger box holds about 5,000 depleted implements. Spector believes the presence of the boxes and the recycling effort will add one more action item for students and faculty in the college's effort to promote sustainability. All campus members are encouraged to use the TerraCycle central collection box for their worn-out writing utensils. "The primary goal of this project is to re-direct a segment of our waste stream, giving a second life to these materials," Spector said. "In a larger sense, this project aims to spark conversations about shifting from a throwaway culture toward one that creates zero waste." TerraCycle, a private U.S. recycling business headquartered in Trenton, New Jersey, operates on the slogan, "Eliminating the Idea of Waste." Besides the national effort to collect used writing utensils, the company runs a volunteer-based curbside collection program to gather heretofore non-recyclable pre-consumer and post-consumer waste, and then partners with corporate donors to turn it into raw material to be used in new products. "The collected waste is mechanically and/or manually separated into metals, fibers, and plastics," TerraCycle says on its website. "Metals are smelted so they may be recycled. The plastics undergo extrusion and pelletization to be molded into new recycled plastic products." Materials accepted in Oswego's TerraCycle project include pens, pen caps, mechanical pencils, markers, marker caps, permanent markers and permanent marker caps, according to the company. SUNY Oswego's sustainability efforts are reflective of a pledge college President Deborah F. Stanley signed in 2007, the American College and University Presidents' Climate Commitment, to demonstrate both regional and national sustainability leadership by modeling the campus as an example of ways society can reduce its carbon footprint. Under the leadership of the Office of Sustainability, SUNY Oswego's students and employees have helped drive initiatives that move the sustainability needle in ways large and small: Save the Trees to reduce paper use, substituting paper straws for plastic ones in campus dining halls and other locations, the Perk Up program to utilize reusable cups, Tap In to promote reusable water bottles, Bike Share to invest in a green way of transportation and the student-programmed Bus Share web application to encourage use of mass transit on and around campus. Wallace said she wanted to leave her mark for future students, much like the ones she teaches locally. The recycling project served as her capstone for the technology course, her senior project under Tryon's mentorship. "In the future, I want students, like my own, to be able to utilize energy more efficiently,” Wallace said. Being a part of the marker recycling project serves as a positive reminder to Wallace. "Do something special, so that in 10 years you can look back and say, 'I made a difference.'" For more information, contact the Office of Sustainability at oswego.edu/sustainability, call 315-312-6601 or email sustainability@oswego.edu. Waste not -- Sustainability advocate Kate Spector (right), a mathematics specialist with the Office of Learning Services, and student assistant Connor Haney, a senior technology education major, prepare to feed used writing implements to a TerraCycle "zero waste" recycling box adjacent to the College Store in Marano Campus Center. Haney and others in technology faculty member Daniel Tryon's class made 212 small wooden collection boxes for deployment across campus.